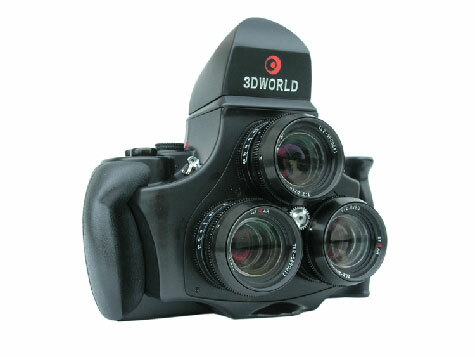 So hail and huzzah to the 120 Tri-lens Stereo Camera from China’s 3D World. As the name implies, the medium-format film camera has not one, not two, but three lenses, each positioned at a specific offset from the others. The camera interpolates between the three views to produce two slides. Once inserted in one of the company’s viewers — handheld, tabletop and coin-operated models are available — the slides combine to produce an image that gives an illusion of three-dimensional depth.